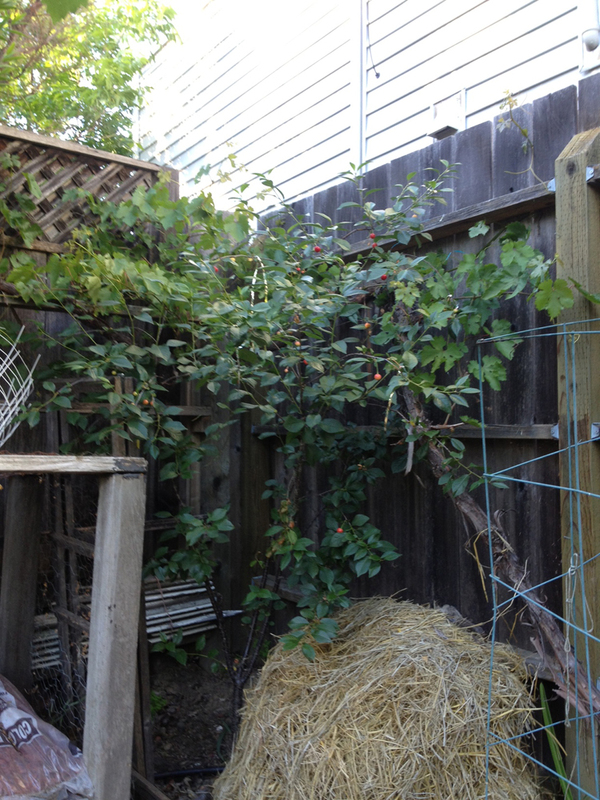 To say it’s tucked away in a corner of our yard is an understatement; we barely noticed its existence behind hay and structural refuse until it set some fruit. I imagine this poor gal has been neglected for some time. I’ve never had a cherry tree before. The fruit has a ripe consistency, but it’s s-o-u-r. Thoughts? Is there any chance that letting it spend more time on the tree will result in sweeter (and not just bird-pecked) fruit? And, assuming the answer to that last question is no… any suggestions on what to do with tiny, sour cherries? In other news, there is garlic randomly interspersed about the garden. We didn’t plant it and we’ve been here since September, so it’s pretty old. If not pulled up, does garlic come back the next year? 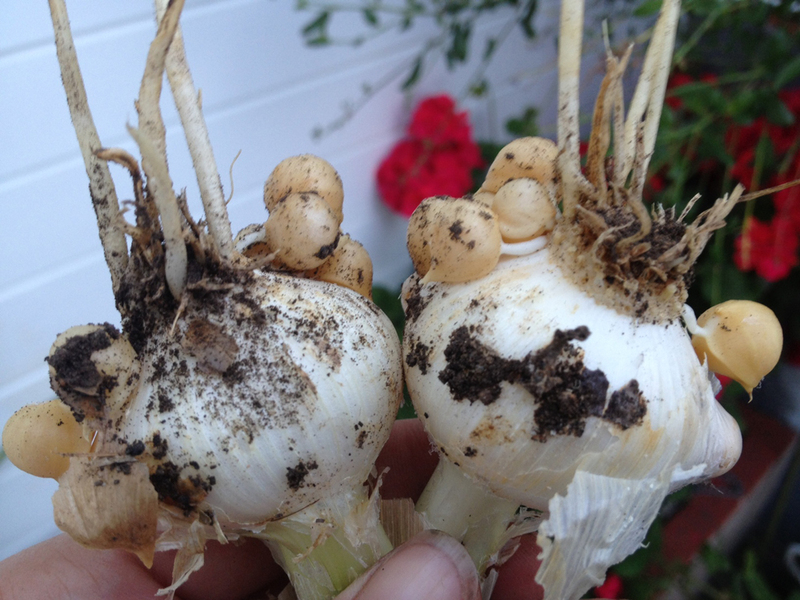 And could its age account for these weird little growths, which I’m guessing are garlic babies? At least one inquiring mind will be grateful for any insight you might have! They look like Washington Pie cherries to me…………and that’s what you do with them….or, they also make wonderful preserves. Garlic left in the ground will often do that – make offsets. You can plant them like small onion sets. Thanks Ana – you, Lauren, and Stevene have convinced me that these cherries are destined to become a pie. I wonder if baking with the cherries would sweeten them up? Sweet cherries always become unbearably sweet in baked things (to me), so maybe sour cherries would turn into just the right amount of sweet? I’m not coming from a place of any expertise. Only guesses. They do look more like pie cherries than sweet cherries judging by the leaves and twigs. They don’t look totally ripe, but leaving them on to ripen is a risk considering the bird factor. Pie cherries have much more flavor than sweet cherries, but pretty much always require some honey or sugar. A little almond extract will bring out the flavor more. One of my best trees here at Turkeysong is a pie cherry, the English Morello. It is annually very productive, healthy, and started bearing at an early age. I freeze them for making deserts through the year. Cherry jam is another possibility. I’m a big fan. You should encourage that tree! The best way to foil the birds seems to be growing so many cherries that they can’t eat them all. That’s a lot of cherries though. Netting can work, but it’s a huge hassle. I love the almond extract tip – definitely going to try that one out. I have some tinsel up in the tree that the birds don’t seem to like, so I hope that keeps them off long enough for the rest of the cherries to ripen. I make my own almond extract. Down around the bridge at State street that crosses Ackerman creek North of Orr springs road on State street, there are some large bitter almond trees. They are wild seedlings or rootstock from old almond orchards in that area. I chop those up and soak them in vodka or brandy or whatever you have. Works great. A little cyanide never hurt anyone! A teaspoon of almond extract, and cranberries instead of cherries, makes a very convincing cherry pie. the cherries look like what we called Weichsel in Austria; sour cherries for preserves and baking, as others have mentioned. I’d love to get a tree of those in my yard! Can I get a few of those from you to try to plant?? If they’re heirloom and not hybrid, they should grow true from seed. p.s. they look totally ripe. They don’t get sweeter. Joel – heck yes! 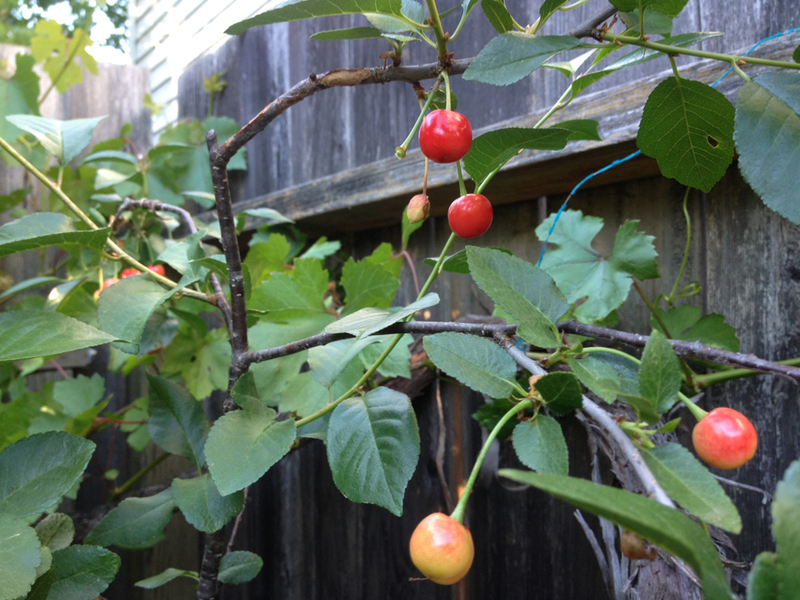 You can definitely try to plant some of these mystery cherries. I’m elizabethries at gmail dot com. Email me to arrange a pick-up time.